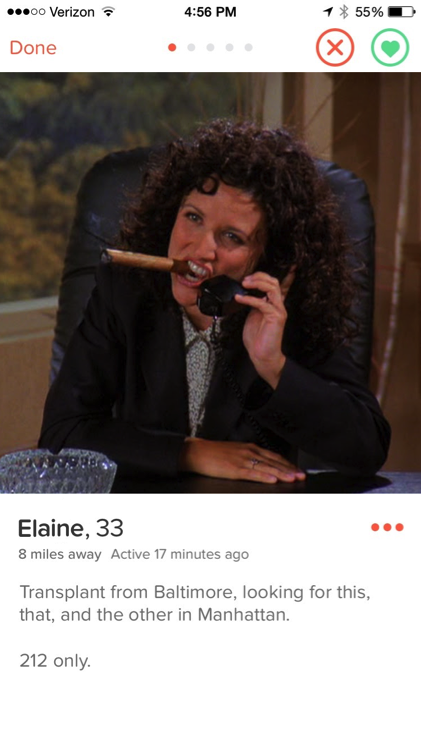 As a recently-single man in my mid-20s, I have started using Tinder. I downloaded the app, with its little flame icon, out of curiosity. I was not trying to meet anyone, but after hearing stories — both successes and stupendous, hilarious failures — about the people being met, I felt it was time to get in on some of the action for myself. Around the same time, I also started re-watching Seinfeld on Hulu. Episode-by-episode and swipe-by-swipe, connections were being made between the classic series and my experiences. While I started this journey into left and right swipes out of hesitant curiosity, these past two weeks have changed my attitude. Tinder’s role in my life has changed. I want a perfect Tinder encounter the way a shorter, stockier, balder man wants to use a perfect comeback line. I am obsessed. On Seinfeld, Jerry is known for breaking up with women and rejecting non-romantic acquaintances for petty, minute reasons. There is perhaps no better way to describe how Tinder works. 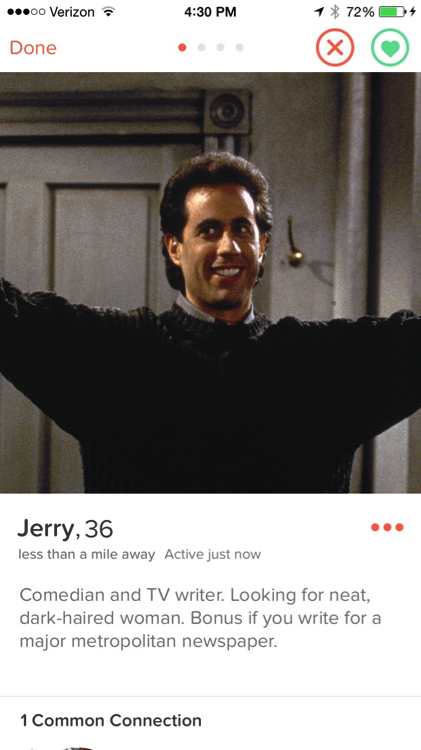 Whereas Jerry ended relationships because women liked Dockers commercials, having “man hands” and being a “low talker,” I have rejected women — likely perfectly nice women — because they seem too invested in sports, misspell words (or use only emoji) in their profile and use low-resolution photos. In my case, I swipe left (that’s the bad direction) on about 70 percent of women based solely on the very limited profiles they provide. If I were meeting these people in the wild, Jerry’s claim that 95 percent of the population is undateable would likely prove correct. George, of course, fares far worse than Jerry does. 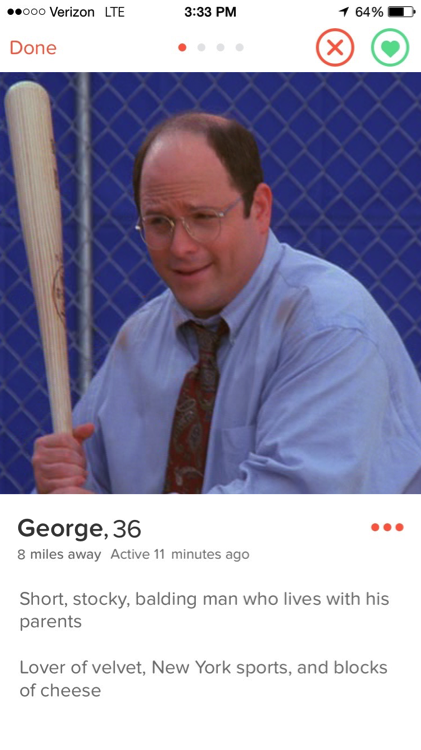 While Jerry rejects women on a near-weekly basis, George struggles to attract them at all. Tinder’s entire platform is based on matching. You swipe right on them, they swipe right on you, and the app lets you message each other. If one person swipes right and the other swipes left, though, you’re left with nothing. Nothing, Jerry! So far, my matches have been very limited. As the wise Mr. Constanza states, “When I like them, they don’t like me. When they like me, I don’t like them.” It is not uncommon to swipe right on someone who seems great and just wait. How can she not like me? I’m a very likable person. But the days go by and no notification comes in and I move on. A desperate man may choose to do the opposite of everything they would normally do, but, for now, I do not. Then the self-doubt starts to creep in. If the gym photo guys can get matches (“Go home to your dumbbells. Work on your pecs. I’m really impressed.”), why not me? Unlike our good friend Elaine, there is no smelly car to blame when I start to question if I am as attractive as I think I am. Occasionally, a match comes in. You’re excited — this is a person who you think might be nice and who apparently thinks you might be nice too. A little confidence gets you to send the first message, and you wait. And wait. And wait. Days go by, and no response comes in. Why join, why swipe, if you’re not going to talk to anyone? Finally, you have the wild card. The girl whose profile is blank or it has so much information you can’t understand it. Her photos are either group shots or extreme closeups of her eye. 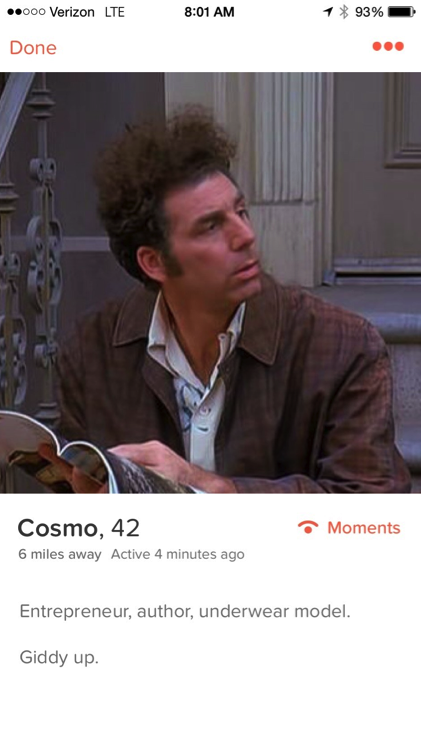 The Kramer. They are pods. They say whatever they’re thinking, with no regard for how the humans might perceive them. They’re out there, and they’re loving every minute of it. But after swiping through people who take themselves too seriously, someone a little weird, a little “Cosmic,” is as refreshing as a Junior Mint in an operating theater.